"We're at the holiest of holies, right here at the epicenter of where it actually happened," the film's producer said. LOS ANGELES — Not many, if any, of the great music documentaries or concert films have ever screened in the exact location where they were shot: "Woodstock" did not show at Woodstock, and "Wattstax" did not premiere at the L.A. Coliseum, needless to say. But Sunday night, "Amazing Grace" had its official southern California premiere right where the recording of Aretha Franklin's live gospel album and belated movie accompaniment went down in 1972: the New Temple Missionary Baptist Church in South Los Angeles. Although the word may not exactly fit with the African-American Christian tradition, the word "mecca" was used a lot Sunday, in connection with intentions to turn the church and its surrounding area into a site that will be recognized by the city of L.A. as a civic monument to Franklin. "To all of you who are here as visitors, we want you to save your directions in Waze, because we want you to come back," said L.A. City Councilman Marqueece Harris-Dawson, addressing the crowd at a reception before the screening. "We will nominate and successfully declare New Temple Missionary Baptist Church a historic landmark in the city of Los Angeles. And so we thank you for being here, and we thank you for coming back." Additionally, Harris-Dawson said," in memorial of this neighborhood's gift of culture to the world, as a beacon for the culture of former African slaves who made their way across the country to build this metropolis we call Los Angeles, on this past Friday we submitted a motion to the Los Angeles City Council and to the mayor to make 87th and Broadway Aretha Franklin Square." On top of all that, said L.A. County supervisor Mark Ridley-Thomas, "We're going to put in an application to have the Southern California Community Choir [which accompanies Franklin on record and film] designated on the Hollywood Walk of Fame with their own star. ... We're gonna do the historical designation and then we're gonna do the walk of fame. She deserves that, doesn't she? Doesn't this choir deserve this? Doesn't gospel music deserve it?" Many of the original choir members were on hand for the premiere, including choir director Alexander Hamilton and standout soloist Mary Hall, who helped organize the screening. They gave an impromptu gospel performance of their own just off the red carpet in the blazing L.A. sun before the screening, while inside, the contemporary version of the Southern California Choir ran through two spirited numbers before the screening. Because the screen that was set up to show the film blocked the area where the choir sat in the filming, the choir members mostly sat amid the audience, creating a surround-sound effect better than anything available via THX. Once the movie started, it wasn't always easy to distinguish between the whoops and audience sing-alongs on screen and what was happening with the 2019 crowd. It didn't hurt that the church building, formerly a neighborhood movie house, is virtually unchanged from how it was captured on screen in early 1972, except for the addition of eight earthquake-proofing pillars in the sanctuary and a changeover from the original theater seats to pews. When Lady Soul walks down the aisle on two occasions (one for each night of recording/filming), attendees turned around to imagine her there. A shot that the original director, Sydney Pollack, took through the projection room window prompted crowd members to turn around and see if that window was still there. It was, although, with a movie showing in the former Mayfair Theatre for most likely the first time since it was converted to a church in 1958, that projection room went unused and a digital projector was set up amid the rear pews. For producer Alan Elliott, who bought the uncompleted film reels from Warner Bros. and shepherded the project for more than a decade, and two producers who came on to the movie later, Sabrina Owens, Franklin's niece and estate executor, and Tirrell Whittley, it was a homecoming to a home they had only previously seen through hundreds or (in Elliott's case) thousands and thousands of hours of looking at the '72 footage. "We could have gone to the ArcLight, easily," for the premiere, Whittley said. "We could have even gone to (the theater in) Baldwin Hills tonight. But the decision, mostly made by this man here (Elliott), was, 'Nope, we're going to the church where Aretha recorded this movie.'" "There's a certain reverence about being here," Elliott said on the red carpet before the screening. "James Cleveland says this in the movie: While they were here for an album and a movie that were being made, it was also a religious service. So to be able to come back for another religious service opportunity and show the movie I think is something pretty special. We're at the holiest of holies, right here at the epicenter of where it actually happened. This place endures, and the r-e-s-p-e-c-t that Johann Sebastian Back's church in St. Thomas has or Wolfgang Amadeus Mozart has with his church in Salzburg, this church should be treated that way." For many of a certain age and spiritual inclination in the African-American community, the album "Amazing Grace" — said to be the biggest selling black gospel album of all time, and Franklin's highest seller to this day —was so important. And that was decades before anyone ever realized there was an unseen film attached. "This is the community I've represented for 30 years, and I've lived in Los Angeles for all of my life," said Ridley-Thomas on the red carpet, "and it's hard to grow up in Los Angeles in particular, or anywhere for that matter, and not have this be a familiar soundtrack, for many people, myself included." Ridley-Thomas grew more solemn when Variety asked about the death a few short miles away of hip-hop's Nipsey Hussle, after a shooting less than two hours before that most of the visiting celebrants were not yet aware of. "I'm doing my best" to keep apprised of the situation, he said. "We send our condolences to any of those who came to know him and respect him and were a part of the trajectory of his life. There was an increasingly more positive perspective on the millennial generation that we saw through him." Later, at the pre-reception, there were gasps and even a shriek or two when Hussle's death was announced. "If you all will indulge me for a second, my heart's very heavy this afternoon," Councilman Harris-Dawson told the crowd. "We celebrate the life of Aretha Franklin. We recall losing Sam Cooke nearby. [Cooke was shot to death at a motel 12 blocks away.] We recall tomorrow is the anniversary of losing Marvin Gaye. And very, very sadly, just this afternoon, this neighborhood's latest Grammy nominee lost his life to gun violence. The one and only Nipsey Hussle passed away at 33 years old about 45 minutes ago. So it's a good time for some good singing," he said, before getting caught up in emotion, as choir member Hall patted his back. Ridley-Thomas further commemorated the fresh tragedy. "It wouldn't be right if we were in a house of worship and we didn't show our ecumenical, interfaith respect," the county supervisor said. "The mark of civilization is how we treat the dead. And so just a moment of silence seems to me to be in order... to focus on the horrific challenge, the epidemic of gun violence, that continues to define too much of the space that we occupy, and I mean that broadly speaking. So let's bow our heads in a moment of silence in memory of Nipsey Hussle and all the others who are stricken with this scourge of gun violence." Hall, who very much deserves costar status on the movie. alluded to the many forms of pain that inform the joyful noise heard in both its 1972 and 2019 forms inside the sanctuary. 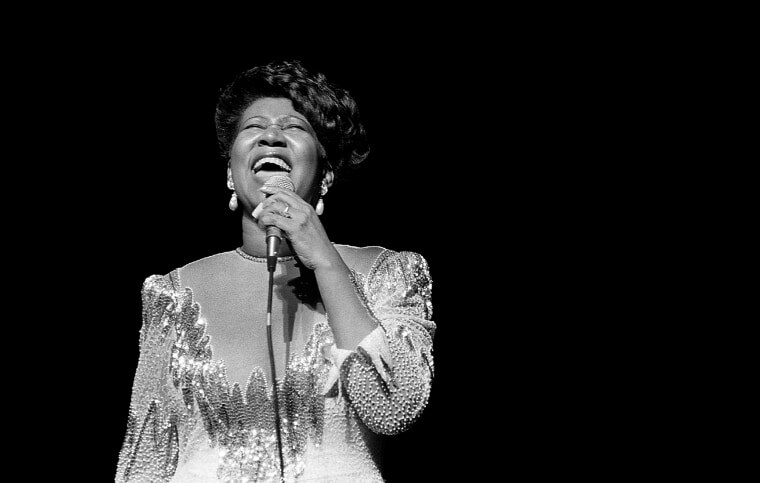 "Forty-six years ago," she said, "when Aretha said, 'I've come through many dangers, toils and snares,' I had not come through any. I was 22 years old, not knowing nothing, a young lady starstruck -- first singing with the King of Gospel (James Cleveland), and then to be with Aretha Franklin at 22 was an awesome experience. But 46 years later, I can truly say that through many dangerous toils and snares, nothing but a God and his amazing grace has gotten us to this point." She then thanked her current pastor for giving her the weekend off to organize the screening and performance and assured him she'd be back at her post next Sunday. It was definitely not a "Hollywood" audience for the premiere, although Grammys producer Ken Ehrlich and a number of agents and managers made the trip to South L.A. The difference was obvious during some of the movie's cameo appearances: The first sight of legendary director Pollack on screen drew no murmurs, the way it has in Beverly Hills screenings, but the first sight of gospel legend Cleveland drew a church-rattling roar. Of course, when Mick Jagger pops up in a couple of audience shots, rocking out to the gospel, that's good for an appreciative laugh in any setting. The producers had other reasons to celebrate. "Amazing Grace" won a best documentary award at the NAACPs Image Awards the night before, besting high-profile films about Quincy Jones and Whitney Houston, among others. Tuesday night, the premiere rollout continues in New York, as a screening takes place in the Time building in Manhattan to be cohosted by music industry titan Clive Davis, Franklin's latter-period benefactor, and Rev. Al Sharpton. The Neon-distributed film opens in limited release in L.A. and New York Friday and expands to about 1,000 screens on Easter weekend. CORRECTION (April 2, 2019 9:07 p.m. ET): An earlier version of this article incorrectly attributed a quote calling for a moment of silence for Nipsey Hussle. It was Los Angeles County Supervisor Mark Ridley-Thomas, not Los Angeles City Council President Herb Wesson.